Though I may not identify with the raw food label anymore, I still find myself using techniques and ingredient combinations I learned from my exploration of raw food on a regular basis. This is especially true when it comes to desserts. What I love about raw (or raw-ish) desserts is that they’re so simple; with such plain ingredients as nuts and dried fruit, you can create a whole spectrum of remarkably creative and satisfying treats. And there’s often less guess work, prep time, and precision involved than there would be with, say, a cake or a tart. During the holiday season, when so many of us have so much cooking to do, an easy dessert can feel like a serious boon. 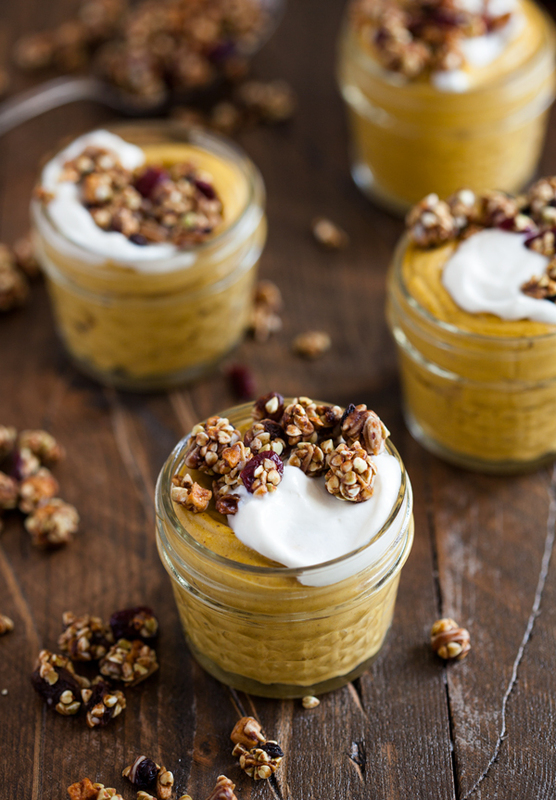 This easy pumpkin cashew pudding isn’t raw, but it is inspired by a lot of the puddings I experimented with in my raw food days. 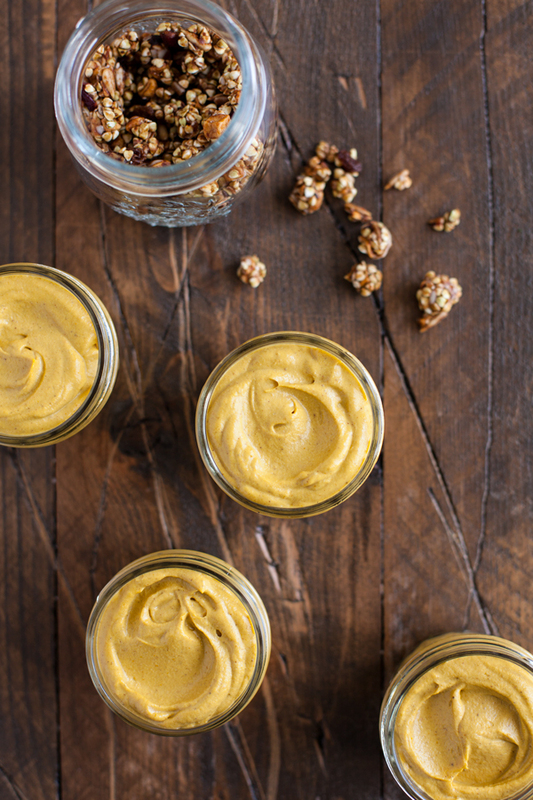 The base is a simple combination of raw cashews, pumpkins, a little melted coconut oil, and maple syrup–along with complementary spices, like cinnamon and nutmeg. I made the pudding a few weeks ago, with a nutrition client of mine. I was doing a private cooking lesson for her, and I wanted to demo a dessert that would feel decadent without requiring any complex technique or previous experience. She had warned me that she’s new to homemade desserts, and I could see she was a little nervous. I assured her that, if you can operate a blender, you can make this pudding. It was such a treat to watch her eyes light up upon tasting the creamy finished product! 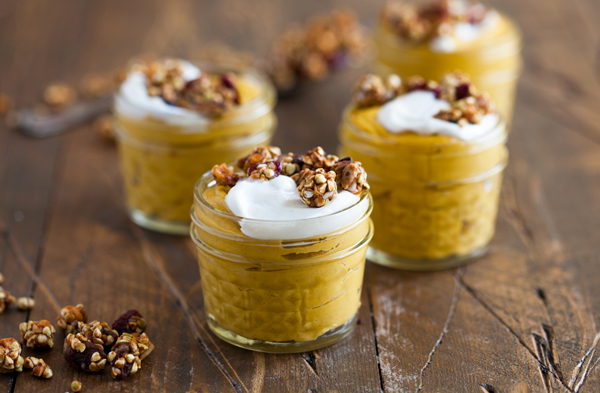 The pumpkin pudding is perfect on its own, silky and sweet. But in order to show my client yet another easy vegan dessert idea, I created a little parfait, using coconut whipped cream as the topping. I’m sure that most of you have seen this technique in other recipes, so I won’t say too much about it, but the idea is that, if you whip up the solid part of coconut milk (what rises to the top and solidifies in a can of the full fat milk) with a little sugar, you can create a simple and delicious vegan version of traditional whipped cream. If you haven’t tried it yet, this is great time of year to experiment, since whipped cream is such a good accompaniment for pies, tarts, creamy hot cocoa, and other holiday treats. Finally, I made the parfait extra special–and gave it some nice texture–by adding a bit of my favorite buckwheat granola to the top. 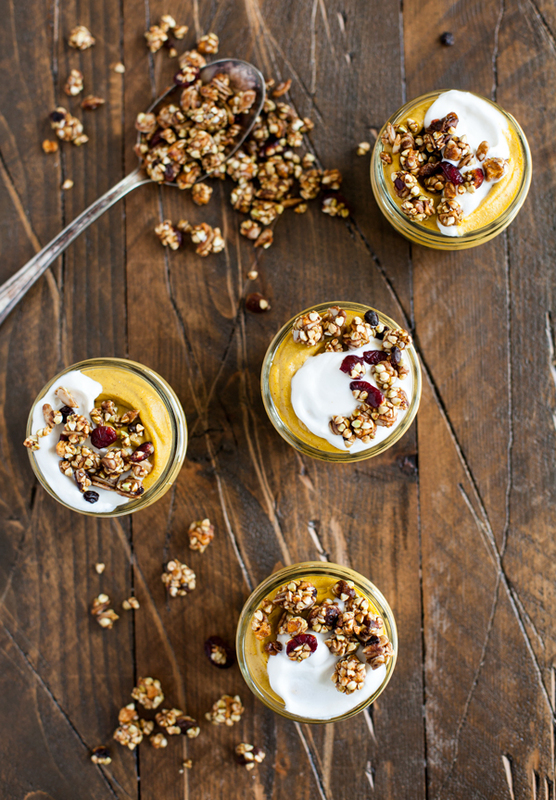 You could add any granola you like–homemade or store-bought–to this recipe. You could also sprinkle on toasted nuts, plain toasted buckwheat, dried fruit, or some chopped dark chocolate. Get creative–anything sweet and crunchy will work! To prepare the whipped cream, place your can of coconut milk in the fridge overnight. The next day, open it up and scoop out the solidified coconut cream on top. (You can save the liquid for smoothies, or discard it). Place the cream topping in a medium sized mixing bowl, and use a hand beater to beat the cream on high till fluffy, about 3-4 minutes, or until it's creamy and smooth and forms very soft peaks. Add the powdered sugar and vanilla and beat for another minute or so. Refrigerate the whipped cream till you're ready to use (it will harden a bit). To prepare the pudding, place all pudding ingredients into a high speed blender or a food processor. Blend till smooth (about 2-3 minutes), stopping as needed to scrape the container down with a spatula. Transfer the pudding to the fridge until you're ready to use. 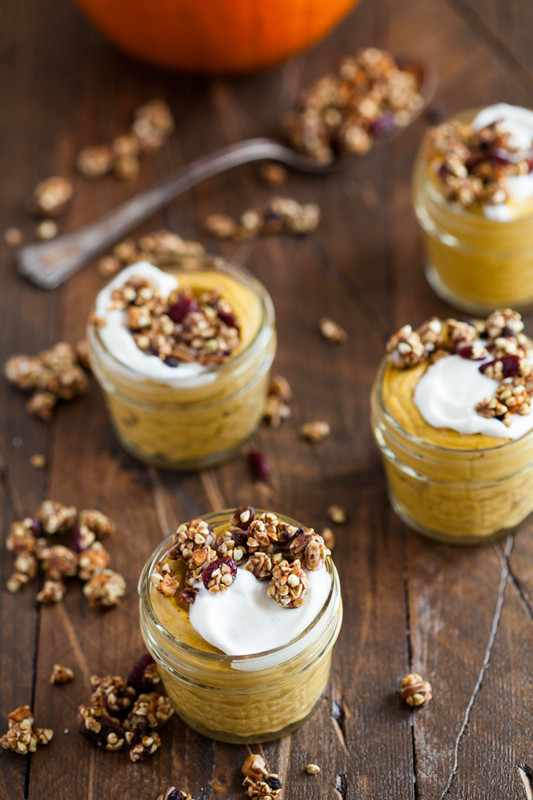 To assemble the parfaits, simply scoop the pudding by the half cup into serving bowls, top with a spoonful of whipped cream, and then sprinkle with two tablespoons of your crunchy topping. Serve! Leftover pudding will keep in an airtight container for up to six days in the fridge. 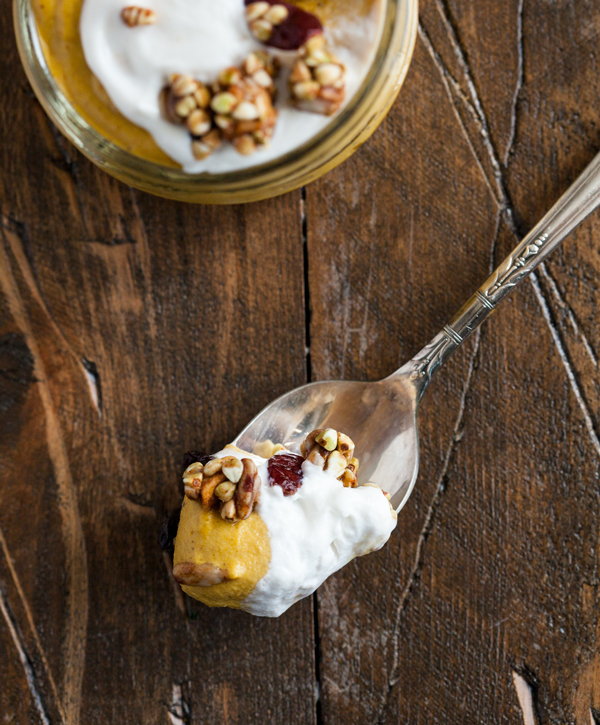 This isn’t a light dessert, and it won’t please those of you who don’t care for cashews! The finished product is very rich and sumptuous, as you can see. But isn’t that what dessert is all about? One final and practical note: both the pudding and the whipped cream can be prepared in advance; the coconut whipped cream will keep for a whole week, and the pudding will keep for up to six days. This means that you can enjoy any leftovers you have in a leisurely fashion, and it also means that this is an ideal dessert for preparing ahead of time, if you’re planning a holiday get-together. It’s nice when the dessert portion of a meal takes care of itself so easily. On this sweet note, I wish you all a great night! 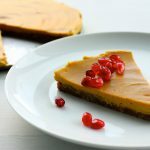 I had to laugh reading Jaime’s comment praising the simplicity, because when I read the recipe, I immediately wanted to make it (just a bit) more complicated by putting it in a raw crust for pie! It looks delicious; I can’t wait to try it! Hi Gena–I’m with Jaime on this about making it easy! (But I also agree with Kyle this would make a great pie filling.) I had to laugh because we must be on a similar wavelength because I have been making a one bowl pudding that’s even “lazier” than this one and trying to decide if I should post it on my blog. You’re nudging me in that direction. Wonderful recipe and perfect for fall., thanks! It is delicious!!! I made three times yesterday. Just cant’ get enough! Oh, just a note. I did not have plain pumpkin puree, but instead I had pumpkin pie mix. It turned out perfect,but in case with pumpkin pie mix you should omit maple syrup otherwise it is going to be too sweet. Enjoy! Great tip, Irina, and I’m so thrilled you like the recipe! for the pudding, did you intend to use more cashews than pumpkin? Rather than only 3/4 cup of pumpkin, i would suggest 2 cups. Aside from that, this recipe was great. Thanks. That was intentional, Barry, for the sake of a thick texture, but you should certainly modify in whatever way works for you! i look forward to making this recipe tomorrow. quick question – perhaps i missed it, but how long do you suggest i soak the cashews? i’ve only done almonds for almond milk and soak those overnight – not sure that’s necessary in this case. i imagine i cover with water, leave on the counter for x minutes/hours, and then strain? thanks in advance! i’m new to this game. 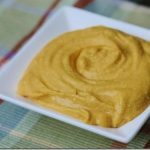 What size can of pumpkin puree? Thanks! We JUST found out that my partner who was allergic to many nuts as a young adult, has grown out of ALL of them (supposedly: so says the blood work, but they’ll have her test each at the office to be sure). A vegan that cannot eat nuts and has a soy and wheat (not gluten) sensitivity. Life is about to change in our kitchen as we speak…er, type. And this might be an awesome start beyond cheese buys. Nice — thanks!